So-- as I thought—the commute home was just long enough to finish the toes of the Turquoise socks. I only had 1 round to work at home before finishing them. Then after dinner—I grafted the remaining stitches—(and some how in the process, misplaced my favorite tapestry needle!) Toes completed, I undid the waste yarn that marked the heel placement, and picked up the live stitches--42 per side—a grand total of 84—and started to work my way to the finished sock. 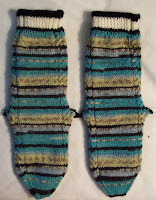 For the heels, I am once again starting at the same point in the color pattern for both heels--close to--but not exacty matching the stripe pattern of the instep. I could have done more work on them –and started the self striping yarn last night—but--these are my subway socks and while I won’t finish them tonight on the way home—(unless there are exceptional delays)I will likely go to my LICKnits group and work on them tonight at knit night. I might have them finished tonight! But the worst cast is being stuck on a subway with NO knitting!--and the rain (rain? I think the north east US is developing a monsoon season!) has been known to cause flooding and delays in the subway. Instead I un-did some knitting. I frogged the half done (for over 2 years now) pair of socks I had started with this yarn. 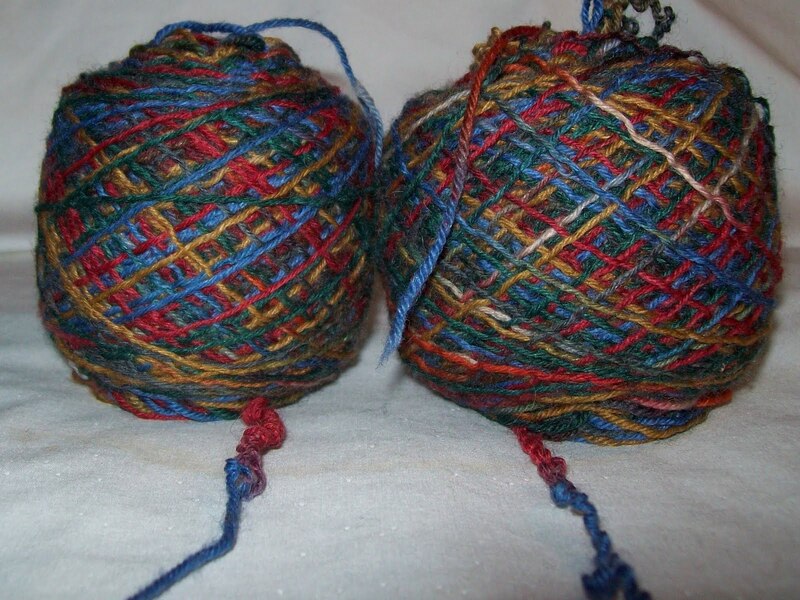 I like the yarn, and I like the pattern I was working—but not that pattern with this yarn. I knew I was never going to finish—so better to undo and start again with a better match of pattern to yarn. Right now—(but that is almost meaningless) I am leaning to SKEW—one of those rare sock patterns that has caught my interest—very definitely a different pattern! But when I actually get around to knitting this yarn--Who knows! Maybe something else will have caught my fancy--or I’ll just do a simple top down or toe up sock and let the yarn shine. The color way is called Jewel Tone—and I like them mix of colors—and there are enough different colors—(and enough of blue) that they will be a good “go with” a lot of different clothes. 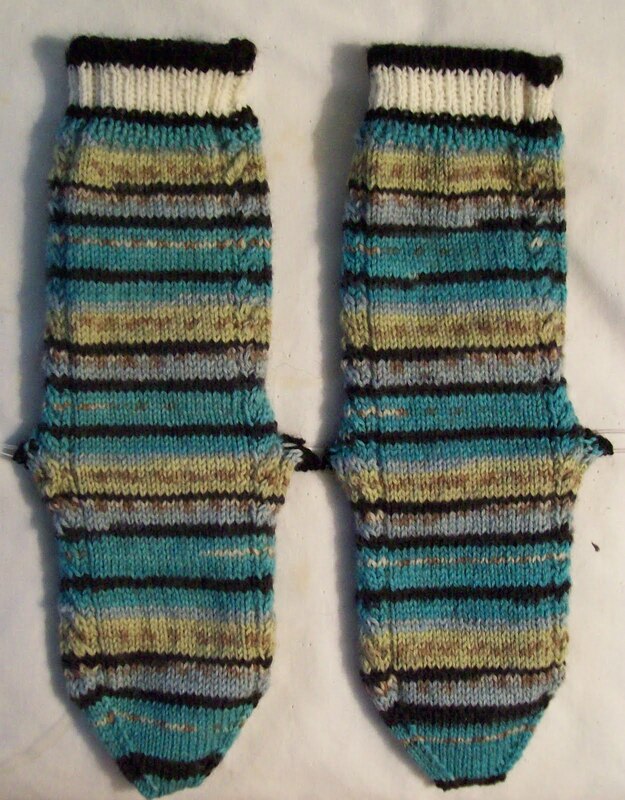 And I cast on for another pair of plain jane self striping socks—More Kroy—(I could do a showcase of all the socks I have knit with Kroy yarn!) several shades of light and dark blues—Good go with denim colors! I think these newest self striping socks are going to be a simple rib--a strong vertical element to contrast with the horizontal stripes of the yarn –maybe a 5X 1 rib—and some eyelets in the purl column—Well time will tell! 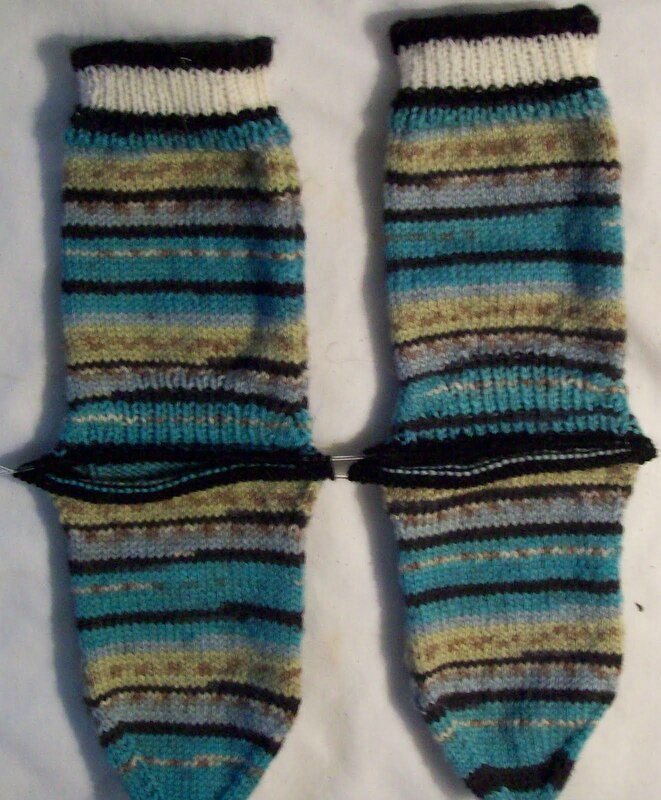 But plain jane socks knit up fast--(just look at how fast the Turquoises socks have been knit up!) 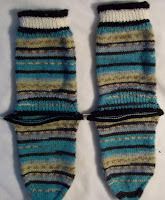 --and utilitarian socks that match clothing (vs creative socks--that look lovely and rarely get worn!) are what are needed right now. And I’ll have too—at some point-- get back to having an at home project to work on—I haven’t really been knitting much at home—a month ago—I caught a cold—and when it was over—a sinus infection (that is 99% gone—but my sinuses remain slight enflamed—just enough to create a post nasal drip—that keeps my coughing and from sleeping well.